Last week the Basque newspaper El Correo published an article on very cheap hotels. One of them was the Kadir’s Tree Houses, in Olympos, Turkey. We loved the idea of sleeping in a tree and started searching for romantic Tree Hotels for your honeymoon. We are sure you did not know that we have one very close by in Spain, in Cabañeros National Park, Ciudad Real. This hotels is ecological with huts built in trees. The most famous one is, without any doubt, the Tree Hotel in Harads, Sweden. A silent place from where you can see beautiful boreal dawns. 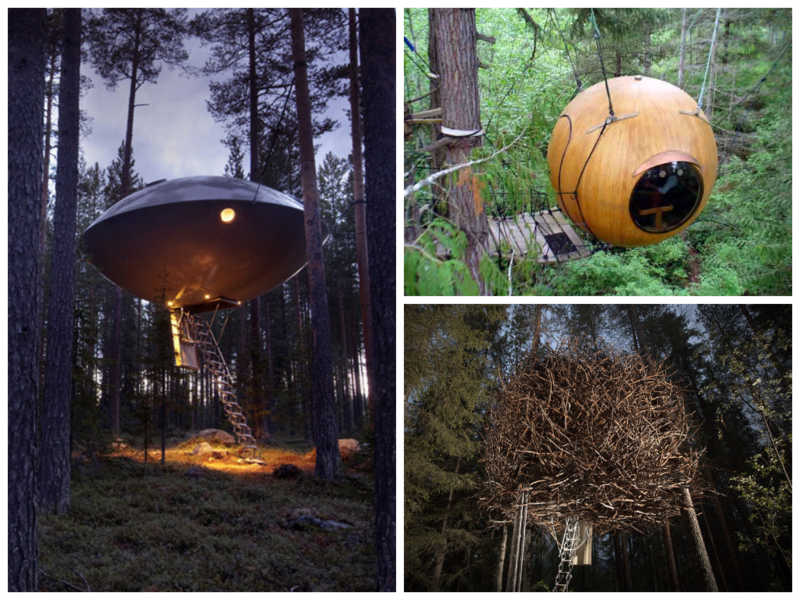 The accommodation options of this hotel are diverse: from a bucket hanging from the tree to a room in the shape of UFO, and not to forget the possibility of sleeping in a nest. Crossing the pool the options are the even more diverse. In Vancouver Island, Canada, we can find the Free Spirit Spheres. A magical space in which we can feel the presence of the wood, the elves and the fairies… Eve, Eryn or Melody are spheres made of natural wood hanging from the trees as if they were a pair of earrings. On their page you can see comments of their guests who describe it as a unique and unforgettable experience. In Canada, close to Perth and over the Sheridan Rapids in the river Mississippi, you can find huts of recycled material. How nice to relax in a place like that! In the United States we can enjoy the luxury that the Post Ranch Inn Big Sur offers on the Californian coast. This hotel has different original types of rooms, such as the ones built between trees, with a fantastic view on the Pacific. But, if what you are looking for is peace and nature, you can relax in one of the beautiful little houses made of wood of the Tree House Point above the river Raging, near Seattle. A similar experience is the one that offers Tree Houses Hotel in Costa Rica. This paradise for bird lovers close to the famous Volcán Arenal, gives us the chance to enjoy the jungle, while staying in original huts, between toucans, monkeys and iguanas. On the other hand, in the state of Kerala, in southern India, we find the Tranquil Resort, an enormous coffee plantation from colonial times. 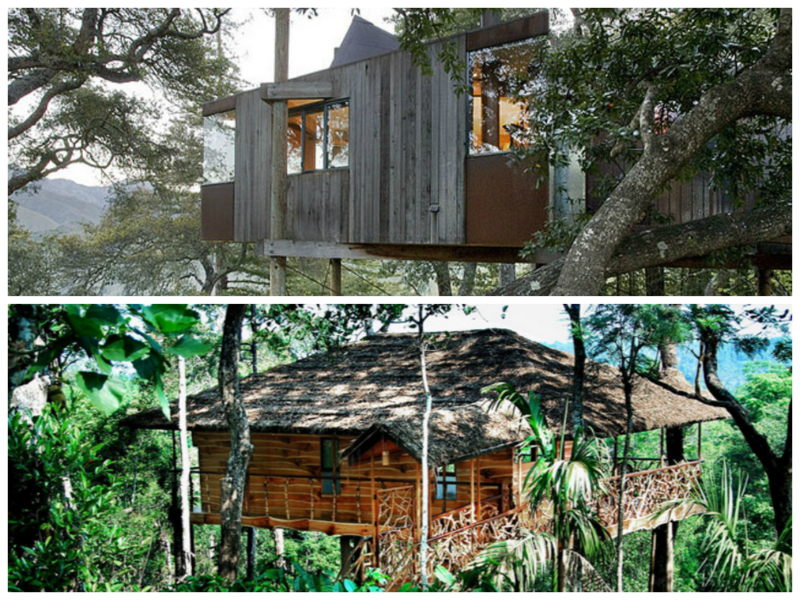 This resort offers comfortable rooms in old trees with a beautiful view at the coffee tree. Finally, the Hapuku Lodge, en Kaikoura, New Zealand, has rooms built at the height of 10 meters in the trees of Manuka, also known as the tea trees. ¿Which do you prefer?